If your waste is fly-tipped, by you or by someone else on your behalf, you could face a £300 fixed penalty notice or an UNLIMITED FINE and/or IMPRISONMENT. 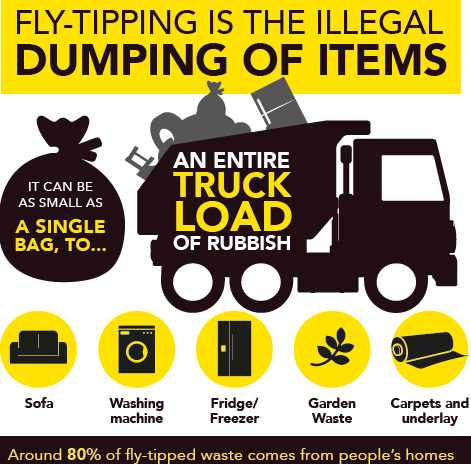 Did you know that over 80% of items that are fly-tipped could have been taken to the Recycling Centre for free. See below for options to deal with your waste. uspect all waste carriers. Don’t let them take your rubbish until they provide proof of registration. Note their vehicle’s registration plate. heck that a waste carrier is registered on the Environment Agency’s website. efuse any unexpected offers to have your rubbish taken away. sk how your rubbish will be disposed of – seek evidence of this. aperwork must be obtained: a proper invoice, waste transfer note or receipt, including a description of the waste being removed and the waste carrier’s contact details. We ALL have a legal obligation, or DUTY OF CARE, to ensure our household or business waste is disposed of correctly. The best way to stop organised fly-tipping is to make sure that only authorised waste carriers take your waste away. Visit your district or borough council’s website to find out about your local bin collections and what you can put in your bins. Find out when your nearest recycling centre is open and what you can take there. Your district or borough council can collect bulky items directly from your house – visit their website for details. Use social media groups or websites like eBay, Gumtree, Freegle and Freecycle. Only donate items to charity shops when they’re open.